Mmm…frosting. Don’t mind if I do! “Happy Anniversary!” – or is it “Happy Birthday?” We’re 9 years old today. For a girl who can’t stay committed to much of anything, I’m astonished to find TwoBitTart is still going – and growing! I starting this blog in 2008 with a different name (Phorenications) and a different mission – and nine years later, what began as a silly little hobby has grown into a big part of my life. This anniversary deserves some cake – like Bananas Foster Cake with Caramel Latte Buttercream Frosting. Combine water and sugar in a small saucepan. Cook over medium heat until sugar melts and turns coppery brown. Remove caramel from heat, cool slightly, and add coffee and whipping cream (caramel may bubble). In the bowl of a stand mixer, beat yolks. Add caramel to yolks in a steady stream. Continue whipping until mixture has cooled to body temperature. Add 1/3 of butter and whip. Add remaining butter and whip until frosting is pale tan, fluffy and a spreadable consistency. In addition to banana cake, this bittersweet frosting would pair nicely with rich chocolate cake. I had such great plans for my post today. However, as is often the case, my “to do” list has ruled the day. 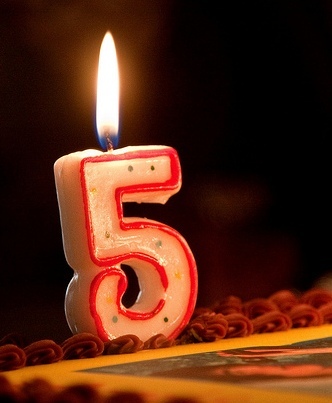 We are five years old today! I can hardly believe it. In these pages, I have stumbled, fallen, picked myself up, soared to new heights only to plummet back down to earth once again – and you’ve been there to watch it happen, sometimes offering a kind word of encouragement and, sometimes, a poke in the ribs. I’m proud that these words have remained true (through my lens) and unedited, no matter how crazy or unattractive they have made me look. You’ve seen my culinary and relationship triumphs – along with the disasters (and typos). Thank you for sticking by me – I hope we make it to 10.